The Kawasaki W1 was a 4 stroke 650cc street motorcycle manufactured by Kawasaki from 1966 through 1971. 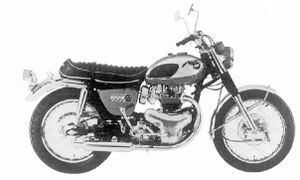 The W-series were the largest displacement Japanese motorcycles available in the mid 1960s. The W1 soon gave way to the twin carbureted W2 models in an attempt to break into the expanding American market. 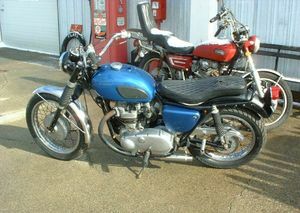 In 1968 the W2TT Scrambler and the W2SS Commander models also became available. The W2 engined used a 4-speed non-unit transmission overhead valve, which produced 50 horsepower @ 6,500 rpm. Up to the 1960s, Japan relied on copying the leading foreign marques. Kawasaki built its first motorcycle in 1951 and, ironically for a marque which became famous for its two-strokes, was the sole Japanese maker with serious four-stroke know-how. 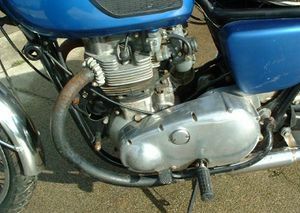 It had absorbed Meguro Works, which had specialized in this field since the 1930s The first Kawasakis were simply re-badged Meguros with a very British 650 twin. 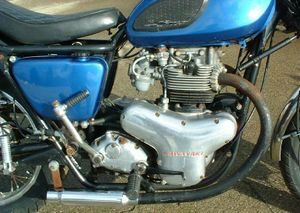 Meguro's first twin had been the 650 T1 of 1955, a sort of patchwork of various British designs of the period, though its engine dimensions of 72x80mm were less "longstroke" than was normal in England. It developed 23.5 hp @ 5200 rpm, could reach over 80 mph, weighed 503 lb and was for a long time the biggest Japanese bike along with the Cabton 600 twin and Rikuo 750. In 1960, Meguro launched its 500 T1, with the same engine dimensions (66x72mm) as the Norton Dominator; it was more potent than the 650, with 33 hp @ 6000 rpm and was good for 90 mph. 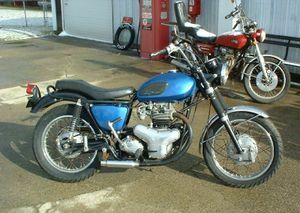 In 1956 the 650 gained a new engine inspired by the BSA A10. 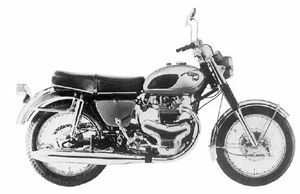 After the 650 appeared for the last time as a Meguro, the Kawasaki W1 launched a new look; it scarcely changed until 1968. It was offered in three versions, including a scrambler with a high-level exhaust. In 1971 these models were fitted with a cross-shaft to move the gear selector to the left and, from 1973, with a disc front brake . Remarks: Kawasaki's first 4 stroke machine. Shift pedal is located on the right side, and brake pedal on the left side. Remarks: Successor to the W1, with twin carburetors, and tuck and roll seat. This page was last edited on 28 November 2010, at 21:52.